Before any one complaints that he/she cannot get the deal - this is B/F sale, starting Nov. 23, 2018. As titled. 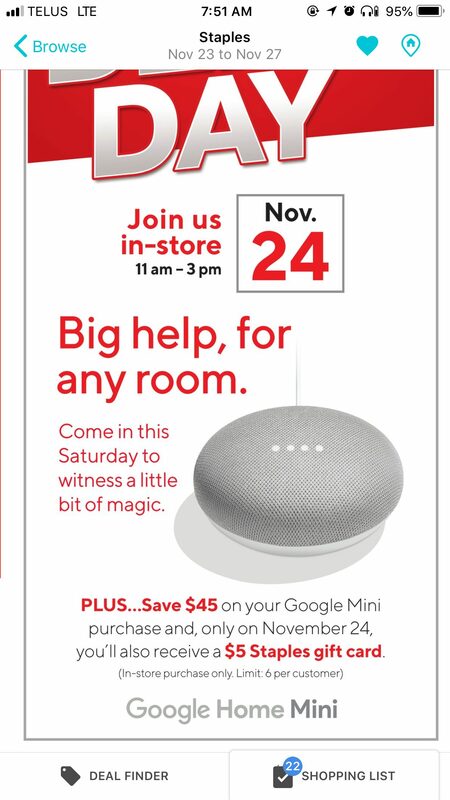 Google Home Mini will be on sale for $35. I bought 2 too many in previous sales...are many folks still wanting/needing these? Price is more than fair but don't we all have as many as we need by this time?? I'm waiting to see them show up in thrift stores like so many Wii Balance boards. Peak AI assistant. My bro still has a Wii balance board mint in box. Not me. I got one for my sis awhile back though. Might pull the trigger. What i'm really hoping for is an ipad deal (similar to boxing day deal last year). $5 at your nearest Salvation Army. If you're really invested in Google's Assistant/ecosystem you may want this, but if the main thing you're going to be using one for is music/podcasts etc., the Amazon Echo Dot 3rd Gen sounds way better. I have alexa built into my thermostat, and all I can say is it's faster to search the house for my phone to google something, than it is to get an acceptable answer to a question from Alexa. Google assistant is definitely better. But many people use smart speakers almost exclusively for music so for that purpose the Dot 3rd gen makes more sense. I'm looking at Staples' flyer. May I know where you are seeing the $5 GC?